My name is Perry, I’m 7 years old and my favorite ice cream is vanilla. The Silver Six. I chose it because I read it once and it was really exciting. I was really excited when we read the part where they finally got out of the orphan building. I thought the guards were gonna get them, but I was wrong. If I had an old paper with a microchip I would find a really old computer and rip the paper and try to run the registry through it. I would say that it's really exciting and some pretty crazy events happen in it. And I liked it when I read it because, like, just six little children flying ships and blowing up a ginormous robot was pretty amazing. Well, when I first looked at it, I thought that they were gonna be getting chased by a ginormous robot and I actually was kinda wrong because most of the robot wasn't really the main thing in the story. I thought it was okay, because I found other interesting things like they were trying to find out what the registries were about and I would have tried millions of things to find it out and it wouldn't have worked. But they were really smart. I would really like to read another book about these characters because I wanted to see what happens to them after they finally get their home back, and what happens to the orphan moon that they found. I actually can't remember one because I haven't read any other books about having to find out about something like this. But when I saw the cover, I thought, Hey! This kind of remembers me of The Robot and The Kid. If you could ask the illustrator one question about this book, what would it be? Well, I first was wondering how did he draw such good pictures? Did he look at a photo or did he make this entire place up? 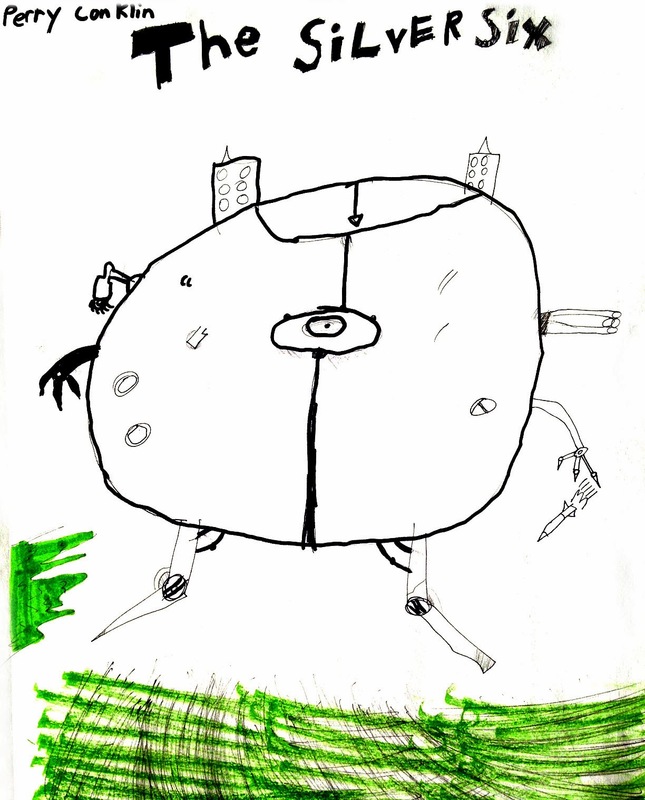 Like, how did he draw such a good robot if he had to make the entire thing up? Great question Perry! And I'm glad you like my drawings! I'm able to draw that stuff because I've spent years drawing from real life and filling my head with ideas, like studying, so that when I need to draw them, I know what they should or could look like. For example, drawing a cool robot or spaceship might mean that I've looked at and practiced drawing things like airplanes or construction vehicles. 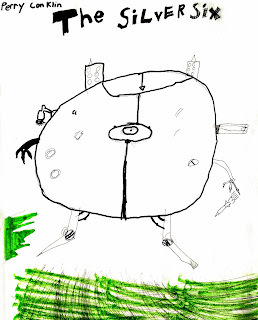 Then, I just use those things I've learned while drawing them, and make up my own inventions, like the giant robot that chases the Silver Six! ...Oh, and some vanilla ice cream might help as well! 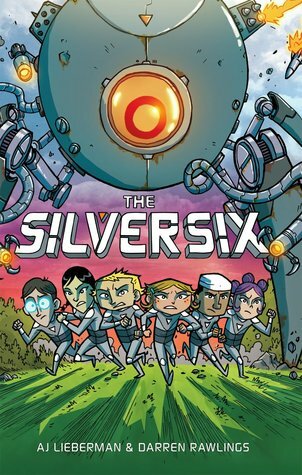 Thank you Perry for sharing The Silver Six with the Kidliterati! 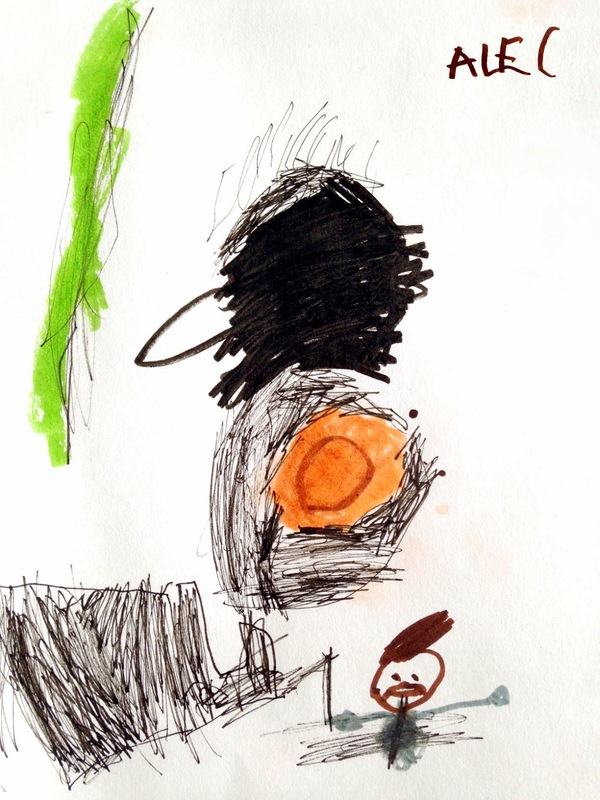 Here's some bonus fan art from both Perry and his little brother Alec. As you can see, this story really captured their imaginations! A group of orphans on the run search for a new home among the stars. When a group of orphans discover they have a common connection, plucky heroine Phoebe leads them in a daring escape from their orphanage to an uninhabited moon. But their idyllic paradise is shattered when the powerful corporate boss who caused the deaths of their parents sends a relentless henchman to track them down. Now, with nowhere left to turn and tired of being on the run, these resourceful kids decide there's only one thing left to do: Fight back! Love Perry and Alec's fan art! There's some real talent now. I enjoyed Perry's insight into the book and Darren's response to Perry's question was FANTASTIC! I should have got you guys to draw the book for me!!! Great art and awesome article! Thanks so much. I'll be sure to pass this along to AJ. Yay! 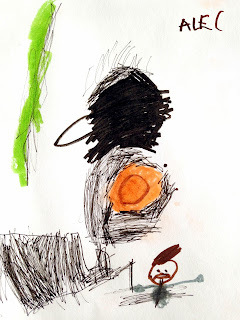 So happy you stopped by the blog. :) Happy drawing!